We consider the fundamental problem of scheduling data mules for managing a wireless sensor network. A data mule tours around a sensor network and can help with network maintenance such as data collection and battery recharging/replacement. We assume that each sensor has a fixed data generation rate and a capacity (upper bound on storage size). If the data mule arrives after the storage capacity is met, additional data generated is lost. In this paper we formulate several fundamental problems for the best schedule of single or multiple data mules and provide algorithms with provable performance. First, we consider using a single data mule to collect data from sensors, and we aim to maximize the data collection rate. We then generalize this model to consider k data mules. Additionally, we study the problem of minimizing the number of data mules such that it is possible for them to collect all data, without loss. 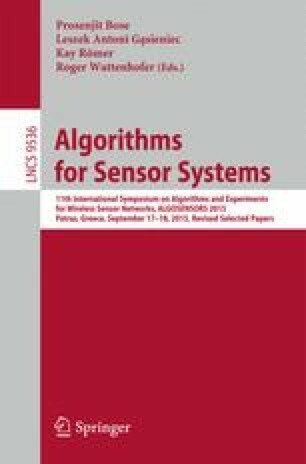 For the above problems, when we assume that the capacities of all sensors are the same, we provide exact algorithms for special cases and constant-factor approximation algorithms for more general cases. We also show that several of these problems are NP-hard. When we allow sensor capacities to differ, we have a constant-factor approximation for each of the aforementioned problems when the ratio of the maximum capacity to the minimum capacity is constant. G. Citovsky and J. Mitchell are partially supported by a grant from the US-Israel Binational Science Foundation (project 2010074) and the National Science Foundation (CCF-1018388, CCF-1540890). J. Gao and J. Zeng are partially supported by grants from AFOSR (FA9550-14-1-0193) and NSF (DMS-1418255, DMS-1221339, CNS-1217823).